A formal Thanksgiving dinner is a wonderful opportunity to gather with friends and family at the table, but let’s be honest: It also can be a heck of a lot of work. Not to mention a timing nightmare for cooks with small ovens or ambitious menus that make it difficult to get 10 different dishes on the table at the same time. So this year, why not simplify and build a Thanksgiving feast out of small dishes that can be prepared hours, or even a day, ahead of time and reheated throughout the day when the crowd gets hungry? Canned cranberry sauce is so boring! This festive recipe pairs fresh cranberries with juicy pears. Preheat oven to 375 degrees. Place rack in center of oven. Spray cups of a muffin pan with nonstick pan spray. To make pie filling, in a large saucepan, stir the water and sugar to combine. Bring mixture to a boil over medium-high, and stir constantly until sugar dissolves. Add cranberries to sugar mixture, and lower the heat. Simmer cranberries for about 10 minutes or until they start to pop. Drain cranberries and set aside. Peel, core and cut pears into 1/2-inch cubes. In a large bowl, mix together pears, ginger and cornstarch. Add cranberries and stir to combine. On a lightly floured surface, roll out each of the 2 dough patties to about 1/4-inch thickness (lightly dust with flour, if needed, to keep from sticking). Gently but firmly press each dough circle into a muffin cup. For the crust edges, use the fold-tuck-crimp method. Spoon filling evenly into the shells and set aside. Bake 25 to 30 minutes, until crust is golden brown. To see if crust bottom is golden, too, use a butter knife to pop a pie out of a muffin cup. If bottom is not brown, bake a few minutes longer. If pie top is browning too quickly, cover with foil for the final few minutes. Makes 16 small or 8 medium-size Cutie Pies. In a large bowl, combine flour, salt and sugar, and mix well. Add butter to flour mixture and mix gently with pastry blender, a fork or your hands. The goal is to lightly incorporate the butter into the dry ingredients. The butter pieces should be well coated with the dry mixture and somewhat flattened. Gradually add water to the flour mixture, 1 tablespoon at a time, and continue mixing dough until it comes together and forms pea-sized or crouton-sized crumbs. The dough should look like coarse individual pieces, not smooth and beaten together like cookie dough. With your hands, gather dough crumbs together to form 2 patties, gently molding the mixture into a patty shape and being careful not to overhandle the dough. Wrap each patty in plastic wrap. Chill dough for at least 1 hour or up to 3 days. The dough can also be frozen up to 2 weeks. When ready to use dough, let it sit at room temperature for at least 10 minutes to soften it and make it workable. On a lightly floured surface, roll out each of the 2 dough patties to about 1/4-inch thickness, lightly dusting it with flour, to prevent sticking, and making sure to roll the dough evenly. Makes 1 double-crust 9-inch pie, 2 single-crust 9-inch pies, 16 cutie pies or 36 mini muffin pies. Perfect for slicing in half and stuffing with turkey or ham. Sift together flour, baking powder, baking soda, salt and pepper in a mixing bowl. Using pastry cutter, 2 knives or your fingers, cut butter into flour mixture until it reaches a coarse, mealy texture. Add buttermilk and mix with your hands until dough just comes together. Form dough into an 8- to 10-inch-wide disk about 1/4 inch thick. Using a 1 1/2-inch circle cutter, cut out 8 biscuits and place on the prepared sheet. 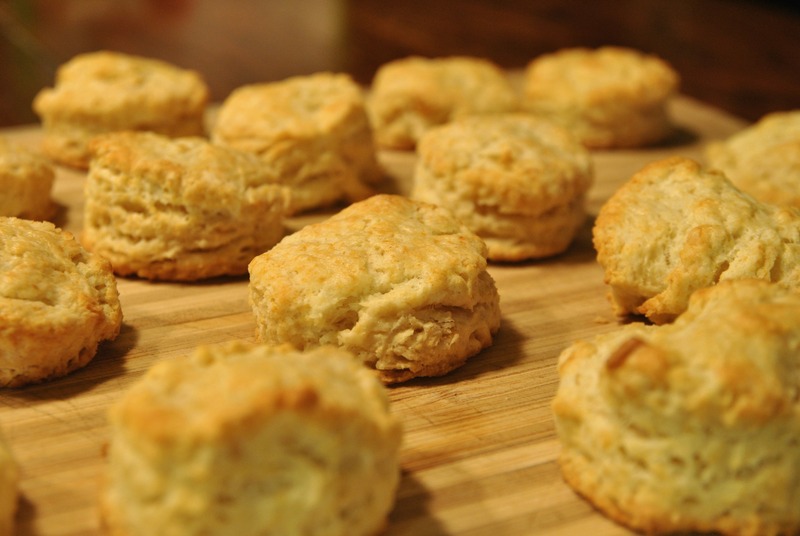 Brush tops of biscuits with cream and bake for 16 to 20 minutes, or until golden brown. Sweet, buttery and salty, all in one delicious bite. You can find Urban Accents’ seasoning mix at Whole Foods, McGinnis Sisters or Market District. Melt 2 tablespoons butter in a large saute pan set over medium heat. Add Brussels sprouts and onions, and saute until onions are cooked through and translucent. Meanwhile, in a small saucepan, simmer seasoning mix with apple juice and remaining 2 tablespoons butter until it’s reduced by half, about 10 minutes. Cut bacon into 1-inch chunks and cook to almost crisp. Drain on paper towels. To assemble, thread one sprout, one onion slice and one bacon chunk onto skewers and brush generously with glaze. Finish under the broiler. Not a fan of pumpkin desserts? These taste almost like gingerbread. Preheat oven to 350 degrees. Brush top of muffin pan with oil and line with 10 paper liners. In medium bowl, sift together flour, baking powder and soda, spices and salt. In a larger bowl, whisk together eggs, pumpkin, sugars and 1/2 cup vegetable oil. Add the flour mixture and stir to combine. Scoop batter into prepared tins. Bake for 20 to 25 minutes, until a toothpick comes out clean. 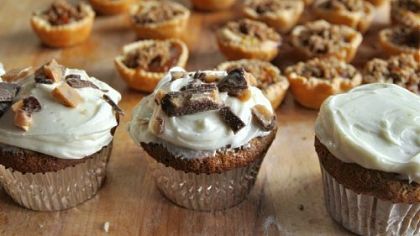 Cool completely, spread cupcakes with frosting and sprinkle with chopped Heath bars. In a bowl of an electric mixer fitted with the paddle attachment, cream all ingredients except sugar on medium-low speed until very smooth. With mixer on low, slowly add confectioners’ sugar and mix until smooth. Don’t skimp on the streusel topping — it’s so good, you might be tempted to eat it with a spoon. Make filling by putting pumpkin puree, maple syrup, cinnamon, spices and salt in bowl. Whisk until well blended and smooth. Add egg and vanilla and whisk until just blended. Preheat oven to 375 degrees. Lightly grease 24 mini-muffin cups. Unroll pie dough on a very lightly floured surface. Using a 3 1/2-inch cutter, cut out 24 rounds, reusing gathered scraps. Working with 1 round at a time, use your finger to gently press the dough into a prepared muffin cup, making sure there are no air bubbles in the bottom and that the dough is pressed firmly and evenly up the side to within 1/4 inch of the top. Repeat with remaining dough rounds. Evenly spoon filling into lined muffin cups. Bake until crusts are golden brown and centers jiggle slightly when the pan is nudged, 27 to 29 minutes. Move muffin tin to a wire rack and let cool for 10 minutes. 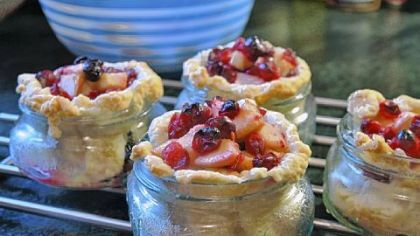 Using a thin metal spatula or tip of a paring knife, remove tarts from pan and set on wire rack. Serve warm or at room temperature. 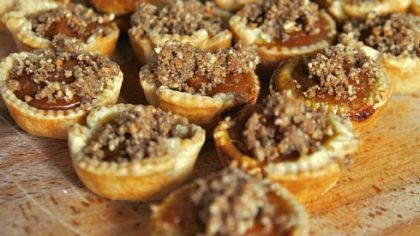 Just before serving, sprinkle tarts with pecan streusel. 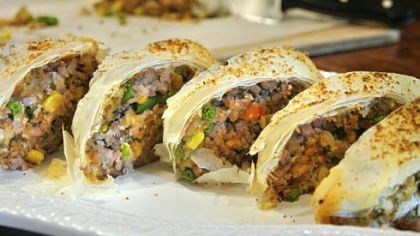 I made these flaky strudels with ground turkey, but I think they would be even better with minced roasted turkey breast. Next time I’ll also throw in a few dried cranberries. Heat oil in a medium saute pan. Add turkey, and cook over medium-high heat until meat is no longer pink, about 5 to 7 minutes. Add vegetables and cook for 2 additional minutes. Fold in prepared stuffing, season with salt and pepper. Add gravy, stir and set aside. Melt butter in a small sauce pan. Unfold 1 sheet of phyllo dough on a board with a long edge facing you. Brush the sheet generously with melted butter. Repeat process, laying phyllo and butter until you have 5 sheets piled up. Spoon 1/3 of the turkey mixture on the edge of the long side of the phyllo and roll the dough tightly around the meat, making sure the roll is even and round. Place on sheet pan with seam side down. Repeat process until all the turkey is used. Brush the tops and sides with melted butter and sprinkle with seasoned salt. With a small sharp knife, score strudels diagonally at 11/2-inch intervals and bake for 12 to 15 minutes, until strudels are nicely browned. Slice along the scored lines and serve warm.